In addition to using the river itself as a character, a metaphor, and a vehicle for the storytelling, another aspect of A River Called Titus is its references to Indian cultural and spiritual themes. 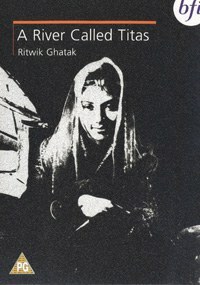 Titash Ekti Nadir Naam (A River Called Titas), is director Ritwik Ghatak's 1973 film adaptation of the autobiographical novel by Advaita Malla Barman. Made shortly after the independence of Bangladesh the film, shot in black and white, is the story of fishing villages trying to survive along the banks of the Titas River. Really, it's several interconnected stories, each following the inhabitants living along the river over the course of many years. A River Called Titas opens with a shot that foreshadows the film's ending, of a dried, or drying, river basin. A song is heard which roughly translates to, "I fear I see the Ganga waters rise to fill the blue sky / I fear I see the boats aground on the dry river bed". The main players' trials and tragedies reflect this theme both metaphorically and literally, as the river itself directly impacts their lives. In fact, it's clear that Titas is a principal character, interacting with and acting upon the others and their stories, just as another actor would, though this is never explicitly referenced. Beside the river, the main figures in the story are tragic couples. First, we see a girl called Basanti (Rosy Samad), who wishes to marry Kishore (Probir Mitra), a fisherman. Kishore and his friend Subol embark on a fishing trip where Kishore rescues Rajar Jhi (Kabari Choudhury) and marries her, intending to take her back to his own village. On the return voyage, however, bandits kidnap the young bride. She escapes into the river, but she is lost, and Kishore, believing her dead, goes mad. Basanti ends up marrying Subol instead, but she too has possible happiness swallowed up by the river when Subol is drowned in a boating accident on the day of their wedding. Ten years pass. Rajar Jhi, having been previously taken in by another village whose fisherman found her on the banks of the Titas, arrives in the village with her young son, Ananta. They are seeking refuge. Rajar Jhi does not recognize Kishore, nor he her because he's still mad. She becomes a figure of conflict in the village because her situation goes against the traditional ideas about marriage and raising a child. Basanti befriends Rajar, helping to support her and Ananta, against her own parents' wishes. The two women forge a friendship that is bonded in the unspoken sense each has of their shared misfortunes. Ghatak intercuts all of the human interaction with shots of the river receding, fishing boats sit in shallow pools, muddy ditches, and later, on dry land far from the edge of the water. As the river slowly shrinks from its former shores, the villagers become less and less tolerant on several levels. First, it's an unwillingness to share provisions, then louder, more mean-spirited gossip about Rajar Jhi, and then a group of men beat Kishore and he dies on the sand, just as he and Rajar finally recognize each other. She is so devastated that she drowns herself. The grief-stricken, widowed bride floating in the shallows, her hair billowing in muddy swirls, brings to mind Ophelia, and Ghatak lingers on that image before cutting to Ananta's cry and then to Basanti in prayer. Again, life on the Titas continues. Ananta is sent to live with another family despite Basanti's protests, as Brahmin landowners begin collecting on loans to the fisherman and their families. Villagers' lives become more difficult. Violence becomes a more frequent occurrence. As its livelihoods evaporate, the village is fractured and its residents become more desperate and self-serving. That which has always connected them—the Titas—is disappearing. In addition to using the river itself as a character, a metaphor, and a vehicle for the storytelling, another aspect of A River Called Titus is its references to Indian cultural and spiritual themes. Classical mythic imagery flows through the film on a course that parallels the river's, to a certain extent. Not coincidentally, the main relationships of Kishore, Basanti and Rajar Jhi mirror tales of the romantic life of Krisha, and the lovers' triangle he had with his wife, Rukmini, and his lover, Radha. Kishore's rescue of Rajar Jhi recalls Krishna's taking the princess Rukmini, and/or his freeing of captive maidens from a demon and marrying them in order to preserve their honor, as well. Several obvious references are made to Bhagwati, the mother goddess, throughout the film. Rajar Jhi and Ananta are seen at her shrine. Ananta has visions of his dead mother and she is dressed as the goddess (or a princess). When Basanti attempts to assume guardianship of Ananta, she continually asserts the importance of a mother figure, and near the end of the film, as she suffers from a beating, she states, "There's only one real thing in the world: motherhood. There is nothing else." Near the film's conclusion, Basanti is remembering, lamenting, the Titas as she walks along the sand. "Look," she says, gazing out over the dried basin from the opening shot, as if willing the water to return, "The river... it's gone." The implication is not lost on the viewer as the villagers wander, disconnected, begging, starving, and dying from thirst. The village has lost its mother, the river. In 2010, the World Cinema Foundation restored A River called Titas using the camera and sound negatives and a positive print provided by the Ritwik Memorial Trust and held at the National Film Archive of India. A print provided by the Bundesarchiv-Filmarchiv was also used. That digital restoration is what is found on this DVD release. The audio track in in Bengali, with optional subtitles in English. The film includes ten minutes of additional material, and the DVD has a biography of Ghatak and an introduction piece by Derek Malcolm.